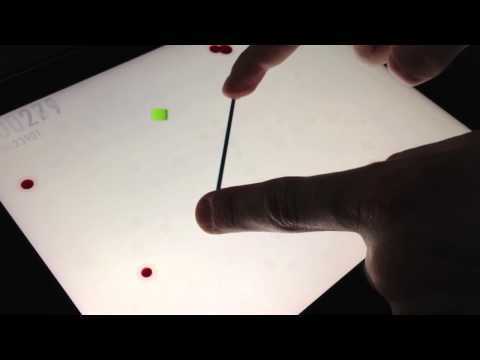 I just want to congratulate @frosty on getting his Codea-made iPad game released. It's called Touchline — at http://touchlinegame.com. Really simple, clean and polished game! WOW! I am getting that straight away! @Jordan, that sounded suspiciously like a pun. @Jordan does the South African App Store have a block on games? I know the Brazilian App Store used to. Thanks for posting this @Simeon, I completely forgot to mention it here! @Jordan It should be available everywhere but has only just launched - perhaps it hadn't rolled out to SA when you looked? I'm hoping to update Touchline soon with some usability improvements, tweaks, and additions to the main game. I'd also like to add achievements at some point. I cannot buy it now because my iTunes account is locked to Download / Buy. Because I got an app on debt. But after paying off old debt, I'll try Touchline!
. @Cabernet I can't answer for @frosty, but it looks like it made its way into the top 100 arcade games, US. Which is well deserved.
.@frosty It looks really, really nice. Can't wait to try it out once I have enough money in my account. Wow... Simply amazing. Good job! I've been looking forward to this! I've made various other prototypes similar to this (simply for practice, not for selling), but none this amazing. Already featured on AppAdvice. Congratulations. Just discovered an issue with this game: it doesn't work (as in, crashes) if I'm not connected to the internet. Just tried it again and it crashes. I'll try again tomorrow when I have internet again. No idea what was going on there. Did a reinstall and it is fine now. hello @frosty , congrats for the game, I just purchased, so late because I was not aware of it.